In October and November 2017, Sebastian Masuda, one of Japan’s most famous artists and founder of the Harajuku Kawaii culture in Japan, resides at the NDSM Shipyard as Artist-in-Residence. In collaboration with NDSM and Amsterdam-based artists, artists, designers, videographers and musicians, he will work on a site-specific performance and installation under the title: ‘Escape from Anonymous (e)’. The performance is shown on the NDSM at sunset on November 18th. Sebastian Sebastian Masuda was born in 1970, Chiba Japan, and lives and works Tokyo. In 1995 he founded the iconic fashion store in Harajuku, called 6% DOKIDOKI, and is known worldwide as the founder of Harajuku Kawaii culture. Sebastian was deaf born and could not hear anything until he was 5 years old. During this period he focused on colors. At the age of 20, Sebastian Shuji Terayama (1935-1983) met avant-garde Japanese poet, dramatist, writer, film director and photographer. Sebastian worked several performing art projects before starting his own theater and brands. In 2014, he made his debut as an artist with a solo exhibition in Chelsea, New York. Since then, he has worked his own projects in art, art, entertainment and fashion, in which colors relate to social-social issues. Sebastian will work and live on the NDSM from the beginning of October until the end of November 2017. This collaboration has been initiated by Eva de Klerk in cooperation with Keito Kohara of Creative Center Osaka in Japan as part of the exchange between the creative makers of the shipyards NDSM and Namura. 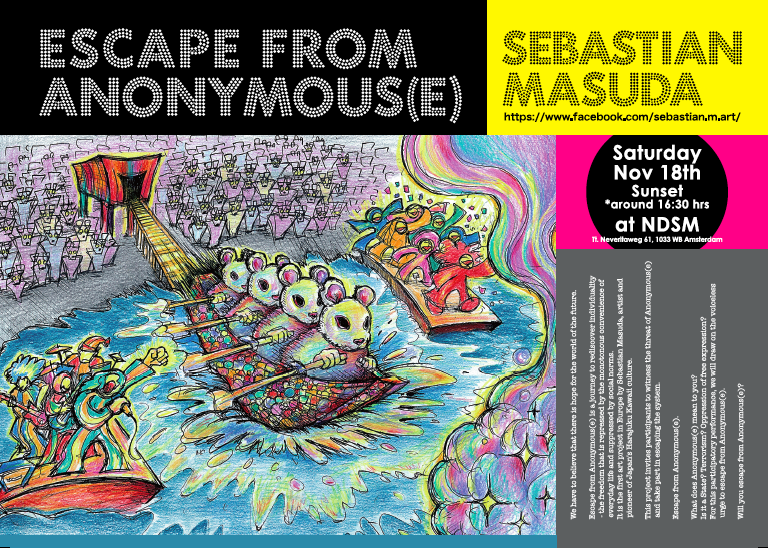 The NDSM artists and artists who met in preparation for his stay gave him such a great inspiration that they are the driving force for Sebastian to create a new and challenging art performance entitled “Escape from Anonymous”. The performance is a collaboration with NDSM-based companies Woodies in Berlin, Frits Snijders Blokloods, Stichting Hummingbird, Street Art Today, NDSM Foundation Foundation, Stichting Kinetisch Noord, Stichting NDSM Open, and also with Amsterdam fashion designers Bas Kosters and Bonne Reijn, and the popular music band Canshaker Pi. By constant collaboration, Sebastian’s work will continue to grow and find it’s final shape. The work ‘Escape from Anonymous (e)’ will be presented at 18:30 on November 18th.